Note to kosher baseball fans: Want kosher options at the stadium? Wait until they win their next World Series. 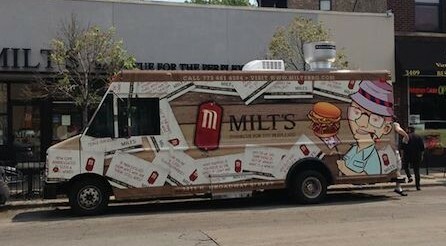 The popular north side kosher BBQ joint, Milt’s BBQ for the Perplexed, launched their food truck back in 2014, but now the truck has a higher calling – serving kosher grub to Cubbies fans at Wrigley Field. The kosher BBQ truck will be in attendance at the majority of Cubs home games at Wrigley (as dictated by the stadium) starting in August, meaning there may be a game or two where they are not present. (Schedule coming soon). The news comes merely weeks after Wrigley Field announced its first ever kosher stand at the stadium less than 2 weeks ago. Menu items on the truck will include: Romanian salami, hot dogs with caramelized onions and mustard BBQ, shredded brisket sandwich, chopped bbq chicken sandwich, & assorted beverages. The truck will be located in the new concourse on Clark just south of Waveland — which is inside the park grounds, for ticketed customers only. Kosher supervision for Milt’s BBQ is the CRC.